Merrill advisor force shrinks to less than 14,000 reps, but production tops $1 million a year. Bank of America (BAC) reported early Wednesday that its fourth-quarter 2013 profits more than tripled, rising to $3.44 billion, or $0.29 per share, from $732 million, or $0.03, a year earlier — an increase of 370%. Its full-year net income more than doubled to $11.4 billion. Revenue improved 14% to $22.3 billion, excluding accounting charges. Still, its return on average shareholder’s equity was 5.74% in the fourth quarter vs. 13.8% for Wells Fargo (WFC) and 10% from JPMorgan Chase (JPM). 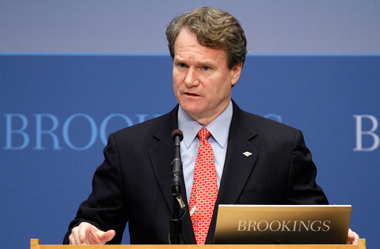 “We still have not approached the true earnings potential of Bank of America,” CEO Brian Moynihan said, leading off the bank’s earnings call with equity analysts. The bank says that losses in its mortgage unit were $1.1 billion in Q4’13 vs. $3.7 billion Q4’12. It made $11.6 billion in home loans in the most recent period, down close to 50% from the prior quarter. Plus, legal expenses jumped to $2.3 billion in the fourth quarter from $916 million in the year-ago period. The number of advisors in the Global Wealth and Investment Management unit, which includes Merrill Lynch, continues to shrink, though the reps’ average fees and commissions are growing. BofA said it had 15,316 financial advisors as of Dec. 31, vs. 16, 611 a year ago and 15,624 in the prior quarter. When advisors working on the consumer and business banking operations are excluded, the number of Merrill advisors stands at 13,771 vs. 14,915 at the end of 2012 and 14,039 as of Sept. 30. The wealth-management group had revenue of $4.5 billion in Q4’13, a 7% increase from the year-ago period. Its pretax margin was 26.6%. For the full year, revenue was $17.8 billion, and the pretax margin was 26.4%, up nearly 11% from the prior quarter and close to 6% from the year-ago quarter.